"If I was to be asked what, in my view, carried ship­board piston-engined fighter design to its zenith, I would reply, unhesitatingly, 'The Sea Hornet!' Of the near five hundred aircraft types that I have flown, I bestow the accolade for sheer enjoyment on this aesthetically superlative product of the deHavilland stable. I have, of course, flown aircraft with better individual characteristics, such as aileron control, but for collective harmony of all features, I have encountered nothing that could excel the Sea Hornet for unalloyed handling pleasure... in my book, the Sea Hornet ranks second to none for harmony of control, performance characteristics and, perhaps most importantly, in inspiring confidence in its pilot. For sheer exhilarating flying enjoyment, no aircraft has ever made a deeper impression on me. Flying this superlative machine was akin to driving a Grand Prix racing car that one knew instinctively was a winner all the way!" Had the Second World War involved the invasion of Japan, it is very likely that the deHavilland Hornet and Sea Hornet would be listed among the greatest fighter aircraft ever built. With a top speed of 400 knots at sea level, and a climb rate of 4,200 fpm, the Hornet offered better performance than the first generation of jet fighters in all but top speed at altitude, coupled with outstanding maneuverability that came from its handed engines which provided torqueless flight characteristics, and a range that would have exceeded that of just about every other Allied fighter, the Hornet was a world-beater. As it was, the airplane arrived on the scene just too late to fully demonstrate its outstanding combination of characteristics. Once the Mosquito was proven in operational concept, de Havilland went to work on the creation of a "single seat Mosquito" which emerged as a mockup in early 1943 as the D.H.103, an airplane that shared little with the Mosquito beyond wooden construction and twin Merlin power. The design and its estimated performance so impressed the Air Ministry that Specification F.12/43 was written around it and work began on two prototypes. Once these had flown in 1944, Specification N.5/44 was written to cover the development of the D.H.103 - now known as the Hornet - as a shipboard day interceptor, which would be fully navalized with strengthened gear, a tailhook and folding wings. Despite the addition of several hundred pounds of naval equipment in the three prototype Sea Hornets, they were only a very few knots slower than their land-based counterparts, with all other perfor­mance characteristics so close as to be indistinguishable. The first Hornet-equipped squadron was No. 64 which took part in the Victory Fly Past over London on June 8, 1946 from its base at Horsham St. Faith. No. 19 Squadron formed with Hornets at Church Fenton in the following October. Nos. 41 and 65 Squadrons were similarly equipped later. The R.A.F. declared all early Hornet F. Mk. 1 aircraft obsolete in 1950 but in 1951 most of Fighter Command's F.3s were dispatched to Malaya for use by the Far East Air Force. They were equipped with underwing rails for eight rocket projectiles or racks for two 1,000 lb. bombs for highly successful attacks against jungle terrorists and were the last piston engined R.A.F. fighters to see active ser­vice. The first Sea Hornet Sea Hornet F.20 was delivered on August 13, 1946, and 79 were produced. 801, the only FAA squadron to eventually use the single-seat F.20 operational­ly, took theirs on charge August 1, 1947 and went aboard HMS "Implacable" in 1949. The Hornet F.3 and Sea Hornet F.20 were distinguishable from the original Hornet by the addition of a substantial dorsal fin extension and horizontal stabilizers of increased span which increased directional stability and maneuverability. The N.F.21, developed independently by Heston Aircraft to Specification N.21/45 and flew as a prototype on July 9, 1946. The N.F.21 served operationally with 809 Squadron from 1949 to 1954, operat­ing aboard HMS "Vengeance" in 1951-52. 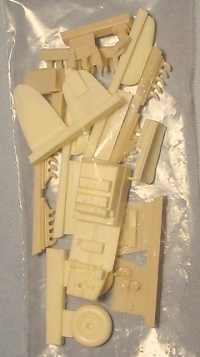 For a very long time, modelers who wanted to build a Hornet had the choice of a very poor kit from Frog in 1/72 from the late 1960s until the introduction of the very good Dynavector Hornet vacuform kit in the late 1990s. When Taro-san left Britain and returned to Japan in 1998, it became quite difficult to obtain this excellent kit, but it is now once again available in limited numbers through HobbyLink Japan. 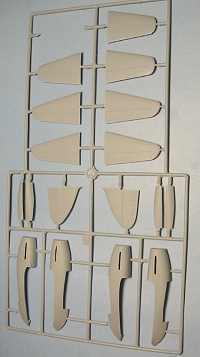 These kits from Classic Airframes - which differ from each other only in the provision of an extra bag of resin parts for the radar nose and radar operator's cockpit and canopy for the FAA nightfighter, and different decals - are to my mind the best-produced kits from this company to date. 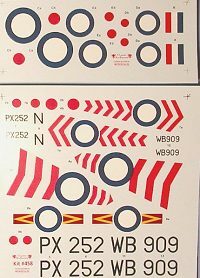 Another reviewer has noted that there are differences in wing chord and horizontal stabilizer span between these kits and that from Dynavector, but there are drawings that certainly support this kit in its produced form. Test-fitting of various parts has revealed there are some minor areas that will require filing and filling to obtain a good fit and finish in the area of the wings and engine nacelles, but this is to be expected in what is still a limited-run injection-molded kit, and certainly presents far less difficulty than I have personally experienced with other Classic Airframes mod­els. The cockpits are done in resin and present good detail. There are two vacuform canopies for each position provided, and these are very clear and properly shaped. The wheels are in resin and look accurate. Another reviewer remarked on the lack of detail in the wheel wells. Admittedly, my Hornet research material is limited, but as best I can determine, there was not much there on the real thing. Those who worry about these things can probably put in a bit if "busy-ness" here with Evergreen strip if they feel it necessary. The decals are by Microscale, and the colors appear accurate. This kit costs $54.95, which is expensive by anyone's standard. I would have expected a photo-etch fret in the kit for the instrument panel and seat belts. While there are racks for underwing ordnance loads, there is nothing provided. In my case, a visit to the spares box will take care of this, but others may not be so equipped. When I consider the level of detail provided in other Classic Airframes kits, such as the Blenheims, these things don't seem too much to ask for. That said, I certainly do not consider this kit poor value. It looks to fit well, and I have heard from other modelers in England - where it was released just before Christmas - that there are no difficulties in building it. 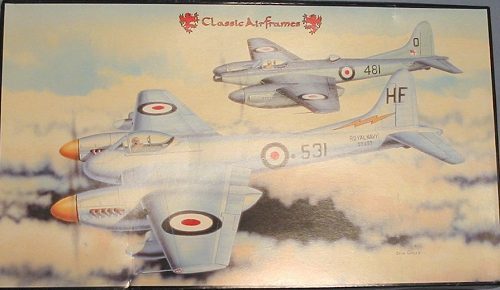 I think the deHavilland Hornet is one of the most beautiful airplanes ever made, and have long wanted one in my collection. 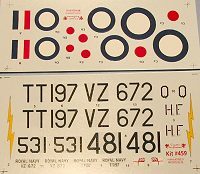 Now that it is here and I see the possibilities - not to mention what will be possible once Roy Sutherland releases his coming Cooper Details sets for these kits and Xtra Decals release their sheet of alternative markings - my only problem is going to be which one to do. Fortunately, it appears that recent threats made to revive my screenwriting career may be more than mere words, so the alternative will be to buy several! Roy Sutherland has examined the Hornet, and has this to say about it: "Overall a nice kit. One error that has been repeated from the Dynavector kit is that the upper wing scribing is a bit inaccurate. There are a whole series of chord-wise panel lines that should not be there. The wing, with the exception of the under wing surfaces (which are skinned in aluminum), is wood. Like the Mosquito, the whole upper surface is filled and sanded and covered in medapolam (a special fabric), which is doped into place. 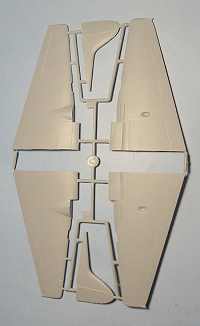 Therefore, access panels should be there, panel lines should not. Also, obviously, the Sea Hornet wing fold and associated panel differences are not represented at all. The main wheels, while nicely done, are too small in diameter. The tail wheel is incorrect as it should be of the anti-shimmy type. Other than that, it appears to be very nice."